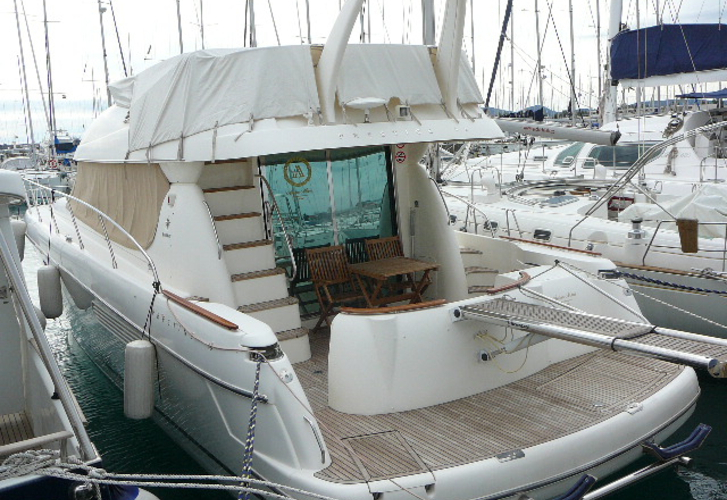 Yacht Jeanneau Prestige 46 called Anima Maris was produced in 2008. We propose this yacht from port Sukosan around Zadar. Anima Maris is certified for 9 passengers. Layout of the sailboat is 9 (6+1+2). 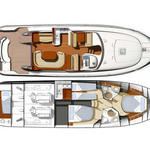 Jeanneau Prestige 46 Anima Maris is equipped with 4 cabins. For comfort of passengers there are 3 toilettes. You can fill the tank for fuel with 1500.00 l l. and in tank for water it goes even 570.00 l liters. With engine 2x500 hp Anima Maris can move really fast. Anima Maris is 14.55 m long and 4.36 meters wide. Depth is 1.20 m. You can see different boats following this link: Motorboats Sukosan. Vessel's equipment consists of : Autopilot, Gps plotter, Bed linen, Radio / cd player, Heating, TV, Bimini top, Dinghy, Anchor electric windlass, Bow thruster, generator. . Deposit is at the level of 4000.00 EUR. Choose our offer and enjoy your holidays on the deck of Anima Maris. 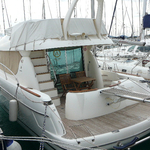 This Jeanneau Prestige 46 from Sukosan from Croatia You can see in this section: Motorboats Croatia.